Designed by the renowned Chris Muth, the MONITOR ST handles all of your input sources, speaker switching, cue, talkback and headphone needs, all in a 1U package with crystal clarity. With its stepped attenuator, five input sources, three speaker outputs, programmable I/O levels, dedicated subwoofer out and more – all accessed via the elegant remote control – you won’t leave the sweet spot while handling all your studio routing effortlessly. the MONITOR ST is so accurate, clear and flexible that you’ll see its remote atop even the world’s best consoles! As the centerpiece of your studio, the MONITOR ST handles complex routing elegantly. There are four analog inputs, three speaker outputs, plus a stereo subwoofer output with programmable level offset and filter that can be assigned to any of the three speaker pairs (or used for a 4th pair of studio monitors). All of these ins and outs can be custom calibrated with onboard, programmable level offsets that you can recall instantly for different devices and configurations. Need to monitor a -10dBV commercial source like a CD player with levels perfectly matched? No problem. The on-board talkback mic, slate output, and the robust 20w/channel headphone amplifier – which can receive the Main Mix or the Aux In for custom artist mixes – round out all the routing needs for any studio. 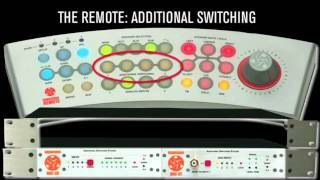 And the Aux Input can be layered with any of the four main inputs, offering up even more routing solutions. Require 5.1, 7.1, 10.2 or greater? Just add the MONITOR SR to your ST system. The SR modules allow you to add as many channels as you need to handle all of your surround monitoring tasks, all with the world-class sound and control that the ST has to offer. And with the Dangerous Music CONVERT-2, you can connect the ST’s remote and control a number of essential switching functions. Customize the five analog inputs, three speaker sets, and dedicated subwoofer output. The company’s mission is to solve the problems of the ‘hybrid studio’ by leveraging the best of both worlds: seamless integration of analog and digital equipment’s strengths and eliminating their weaknesses. Since product designer Chris Muth’s time has been spent almost exclusively designing custom equipment for many of the world’s preeminent mastering engineers and facilities, the combination of a mastering quality audio path with an intuitive feature set became the company’s baseline. It is worth noting that these designs evolved not in a vacuum but with input from some of the best ears in the business, refined in a working mastering environment instead of on paper. In the end, listening makes all the difference. Born out of the shop at Dangerous Music recording studios, the equipment company was officially founded in 2001 with the commercial release of the Dangerous 2-Bus analog summing amplifier. Dangerous Music product designs were created to answer the sonic and ergonomic challenges presented by the changing studio environment as it moved from analog consoles and analog multi-track tape recorders to hard-disk recording and software-based digital mixer/editors, collectively known as digital audio workstations, or DAWs. The process of recording and mixing without an analog console or tape deck created the opportunity to develop products that allowed engineers to embrace all the power and convenience of a DAWs automation, editing and recall, while continuing to work as they had, with console-style tone and headroom, hardware monitor control, metering, speaker and input source switching, and the ability to insert analog processors into the signal path easily and with the highest quality results.